Mark Levin, who was on vacation, came back with a fierce threat today. Levin promises he will do "everything in his power" to defeat Sen. Rand Paul if his father, Ron Paul, runs as a third-party candidate. "If Ron Paul decides that he is going to go third-party, which is detrimental to this nation, and pulls a million votes, which is relatively insignificant in the big scheme of things, I will do everything in my power to defeat his son in Kentucky. 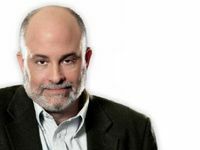 I will do everything in my power to defeat his son Rand Paul in Kentucky," Mark Levin said on his radio program tonight.